The virus & spam filter analyses all emails that are delivered to your email account. It is activated by default when an email account is created. You can enable or disable the spam filter for all email accounts on your domain from Mail Administration in the One.com control panel. We recommend that you keep it activated for all accounts. Go to Mail Administration, in the top left corner. Under Accounts, click on the tab called Virus & Spam. Move the slider to activate or deactivate the filter for each email account. 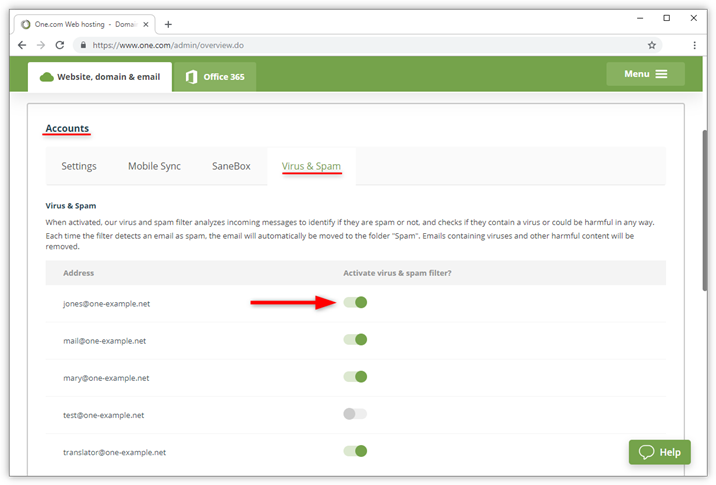 Note: It's also possible to enable or disable the virus and spam filter for each account seperately from Webmail: How do I activate the virus and spam filter from Webmail?